A board with bold letters announces the chemical free and GM free status of Enabavi village in Warangal district. The village stopped using pesticides 10 years ago and adopted organic farming five years later, much before the state rural development ministry decided to officially recognize npm. Enabavi, with over 110 ha of farmland managed by 52 families, has now become a learning centre for neighbouring villages. Located 80 km from the state capital, it has become a mandatory stopover for members of non-profits, ministers, planning commission members and international organizations keen to gain firsthand knowledge of how organic farming is changing lives for the better.Enabavi made news in Delhi last month at the Indian Organic Trade Fair organized at pusa Institute where Enabavi rice packets sold like hot cakes. In 2003, there were two types of farmers in Enabavi those who used pesticides and fertilizers and others who practised organic farming. The yields of both groups were the same, but those who followed organic farming methods were earning a few thousand more as they were not using chemicals. Since then, all farmers have converted to organic farming. The forum was formed eight months ago with the help of t he state agriculture university and the agriculture department that have been actively promoting organic farming. Were the farmers open to the idea of adopting organic farming methods? The farmers have been very enthusiastic about shifting to organic farming. There have been instances when members of the pesticide lobby have tried to dissuade farmers from shifting to organic farming. But farmers are determined to go ahead with the change. What is the strength of the forum? The forum has about 7,000 farmers who together own 1,000 hectares across the state. We are concentrating on growing and marketing organic vegetables and fruits like apples, lichees, almonds, plums, apricots and mangoes. As many as 56 farmers have obtained organic certification for their produce and another 2,200 will get certification in about a month. The farmers have to pay just Rs 1,000 each as certification charges. How have farmers benefited from organic farming? By shifting to organic farming, farmers have been able to save 80 per cent of the cost of cultivation. Their yields have also increased. For example, 100 apples grown by using pesticides and fertilizers, weigh 20 kg while the same number of apples grown through organic farming weigh 24 kg. The fruits have more flesh and taste better. They also remain fresh for a longer period. The farmers are able to get better prices and are making profits. Soil fertility too has improved in the orchards across the state. Are you exporting organic fruits? Have you decided on a brand name? We have not thought of exporting as yet. India itself has a big market. We have not even started exporting to other states. We plan to market our produce under the brand name of HOFF. The brand should be out in the market by next April. The fields in the village look unkempt as friendly weeds are allowed to grow. "Now we don't spray bio-pesticides as there are no pests," said Ponnam Mallaiah, a 60-year-old farmer who owns about 8 ha. He grows paddy, red gram, sesame, tobacco and vegetables in his fields. The villagers used pest repellants for just the first two years. After that pest attacks stopped, said Narasamma, Mallaiah's sister. "We have also stopped using urea as it makes the plants grow faster and succulent, which attracts pests. Organic farming has created a balance between friendly and harmful pests," she said. Twenty-year-old Ettaboina Mahender said only natural fertilizers are used. 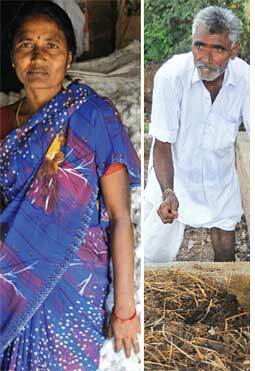 "Cow dung, cow urine and vermicompost is used while preparing the soil for cultivation." Demand for cow dung in turn has led to villagers increasing their livestock. "Now we use cattle for ploughing and have stopped using machinery," he said. Tractors used for ploughing charged Rs 2,000 per acre, but bullocks on lease charge Rs 1,000. Mahender is thus saving Rs 1,000 per acre. In place of synthetic urea, farmers use azolla, a fern-like plant, as fertilizer in their paddy fields. "Azolla spreads rapidly. It helps to suppress harmful weeds. Panchagavya, prepared by combining cow dung, urine, milk, ghee and curd, is used as a growth enhancer. It improves the taste, colour and texture of vegetables and fruits," Mallaiah said. The paddy fields have a one-foot-wide gap after every three metres to help aerate the plants and also prevent snakes, rodents and the brown plant hoppers from destroying the crops. The pests use the alleys to move about and leave the crops alone. The savings per acre of paddy by creating alleys is over Rs 5,000, said serp officials. The villagers ensure seed quality through mutually beneficial arrangements. The farmers who grow good quality grains are offered incentives for preserving their harvest as seed. "A farmer gets Rs 900 for a quintal of paddy. If his grain quality is good, he is asked to keep the yield as seeds for the next season and offered Rs 1,200 per quintal," Narasamma said. This saves money as buying seeds from the market would cost Rs 2,000 per quintal. Farmers experimenting with traditional methods of crop protection have come up with varied versions of chemical-free agriculture. Most farmers are using intercropping to control pests, improve soil fertility and make farming profitable and sustainable all the year round. Pheromone traps are being used in villages across the state to find out the level of pest infestation in fields. Villagers have further improvised on the design. Instead of the usual funnel-shaped contraption, bottles are used. These bottles are used to trap pests. Four pheromone traps are enough for one acre. Villagers have also tried out, successfully, new bio-formulations. Annasuryamma, a 45-year-old farmer of Barravaripalem village in Guntur district, made her own pest control concoction by fermenting nandivardanam flowers (Tabernaemontana coronariae) which saved her chilli crop from leaf miners. She also used egg, lemon and neem pulp as fertilizer. She found out that fish waste, jaggery and hing helped strengthen the root system. Fermented buttermilk with cow urine, green chillies and garlic paste was found useful in controlling sucking pests in chillies. Another common bio-fertilizer is ghanajeevastra, made from cow dung, cow urine, jaggery, gram flour and chemical-free clay. It is applied to the soil before sowing and at regular intervals afterwards. This fertilizer is used in place of urea and diammonium phosphate. It activates earthworms, increases water retention capacity and controls pests. For some, bat manure during sowing proved effective for musk melons. It improved the germination and fertility of the crop. Another farmer, A Yashodamma of Kadapa district, controlled thrips and mites through intercropping chillies, brinjals and tomatoes with chrysanthemum. Last year, she earned a profit of Rs 35,000 by selling organic chillies and flowers. This year, she expects a profit of Rs 60,000. One of the driving forces behind Enabavi's success story is R Lingaiah, secretary of the Centre for Rural Operation Programmes Society (crops), a non-profit. The village has become famous in the neighbouring districts and people travel miles to buy Enabavi produce, Lingaiah said. Organic farming has helped the villagers repay their debts. "If the farmers had continued to use chemicals, their debts would never have got cleared," Narasamma said. Well kept kitchen gardens, pucca houses and washed streets dotted with rangoli patterns greet visitors in Ramachandrapuram. The village has over 120 ha of farmland and nearly half of it was mortgaged by 2005. The farmers of the Koya tribe who were growing cotton, the most vulnerable of all crops, started mortgaging their land after yields started decreasing and farm input prices went up. Most of them ended up mortgaging their land with the moneylender who was also the local dealer for pesticides and fertilizers. 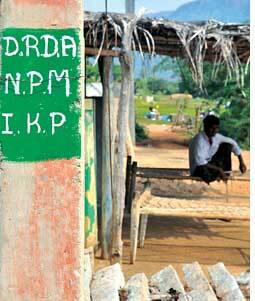 "Within two years of switching to npm farming, the villagers were able to free their mortgaged land," said Lakshmi, who along with her husband M Rajulu, was the first to take up npm. Besides reclaiming their mortgaged land, 10 farmers in the village have also taken about eight ha on lease. Lakshmi is the coordinator of the Durga Mahila Samakhya, one of the women's groups in the village. The group has managed to access funds at lower interest rates through the District Rural Development Agency. "We have paid back most of the loans and are now trying to identify markets for our produce," Lakshmi said. Rajulu has been recognized as the best farmer in the district for growing high yielding non-Bt cotton using npm methods. "I have managed to grow eight to 10 quintals of cotton along with a quintal of green gram and 15 kg of pulses and millet in just one acre of land," he said. Rajulu expects to net Rs 15,000 on an investment of just Rs 1,500. His paddy yield has also gone up to 18 quintals per acre as against six quintals an acre when he was using pesticides. Ramachandrapuram was nominated by serp this year for the Citibank's change makers award given out by US based Ashoka Foundation after it became completely debt free. Taking cue from Rajulu, other villagers have also started inter-cropping wherein many crops are grown on the same patch of land. Pulses, millets, sesame and vegetables are grown together. "The farmers now know that inter-cropping is good for the soil, sustainable and profitable," said Shyam Sunder Reddy, district project manager for NPM. 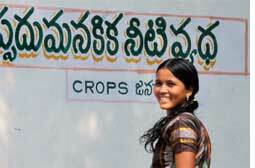 The farmers of Ramachandrapuram now send their children to private schools for education. Lakshmi's son, Ramesh Babu, is the first postgraduate in the village. From debt-ridden status to a debt-free society; the villagers of Ramachandrapuram have made their own destiny through hard work.